Several days ago, Him Law fell sick and had a fever. His family forced him to take time off from work and see a doctor. “After taking the medication, my face got a bit swollen.” In order to quickly reduce his face’s swollen appearance, Him will diligently massage his face and lymph nodes to reduce water retention. Since Him rarely fell sick in the past, he thought that his body may have suffered allergic reactions to the medications. Perhaps his recent grueling filming schedule while filming for TVB drama, Mother to Mother, may have worn out his immune system. Him Law’s ex-girlfriend, Theresa Fu (傅穎), returned to Hong Kong two weeks ago. Last August, Theresa had accused Him of cheating in their former relationship and even beating her. When Theresa was asked whether she had any advice for Him’s currently rumored flame, Tavia Yeung (楊怡), Theresa said that it was inappropriate to comment on other people and had no advice to offer. 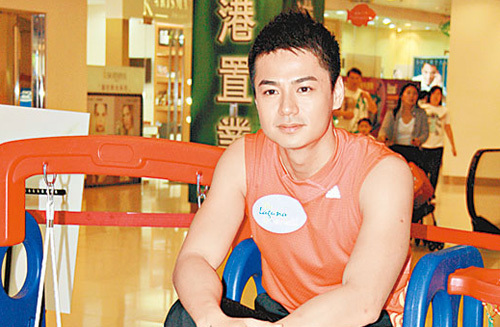 It was best for Tavia and Him to let things develop naturally. Theresa deflected further questions regarding Him Law, indicating that she did not wish to discuss the past; it was more important to look towards the future. Him Law had brushed aside last year’s “cheating and beating scandal” in the same manner. Jayne: I suspect Him Law got sick after filming day and night in his new TVB drama. His career is definitely on the rise, while Theresa Fu is banished to China and rarely returns to Hong Kong anymore. Theresa gave the correct PR reply when asked about Him and Tavia. OH POOR HIM HIM 🙁 PLEASE DO TAKE CARE N GET SOME GOOD REST. HOPE U GET BETTER SOON. good look does get far, doesnt it? He needs to brush up his skill. Very poor n unconvinsing acting skill. Given rate 1-5, i would give him maybe 2 the most. Not gonna dispute rating but he has potential and that is great in light of so many duds. Plus he does look good, head small notwithstanding. Good looks can get you far in some cases, but not always. You still need luck, connections, timing,etc… There are plenty of actors and actresses that look good, but whether they go far or not is a different story. Er I don’t think he’s a great actor either but I saw D.I.E. Again and On Call 36 Hours and he blew my mind. Vast improvement. Theressa’s comment is taught by PR crew. Hehe, sounds like she dun wanna something more scandalous or Filmko threaten her to not do such thing. I think he said in an earlier interview that he has to lose some muscle for his new project, so I’m assuming it’s for this drama.